I finally photographed the inner working of my vintage grandfather clock. I still remember my dad working on it in the garage for years. Before that it stood in my grandparent’s house as long as I can remember. Inside are the initials M B could this be my great-great-grandfather, Mitchell Bowker from Vermont…Hmmm. 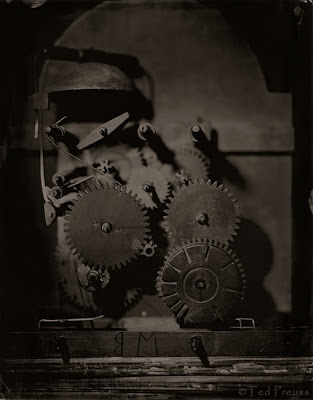 Here’s an interesting site that inspired me to photograph it as a wet-plate collodion tintype.